Western blot analysis of whole cell lysates probed with NTRK3 antibody (VMA00154) followed by detection with HRP conjugated Goat anti Mouse IgG (1/10,000, STAR207P) and visualized on the ChemiDoc™ MP with 299 second exposure. Arrow points to NTRK3 (molecular weight 100 kDa). NTRK3 antibody recognizes the NT-3 growth factor receptor, also known as ETS related protein-neurotrophic receptor tyrosine kinase fusion protein, ETV6-NTRK3 fusion, GP145-TrkC or tyrosine kinase receptor C. This antibody has been extensively validated for western blotting using whole cell lysates. Mouse anti Human NTRK3 antibody recognizes the NTRK3 growth factor receptor, also known as ETS related protein-neurotrophic receptor tyrosine kinase fusion protein, ETV6-NTRK3 fusion, GP145-TrkC, NT-3 growth factor receptor and tyrosine kinase receptor C.
The NTRK3 gene encodes a member of the neurotrophic tyrosine receptor kinase (NTRK) family. This kinase is a membrane-bound receptor that, upon neurotrophin binding, phosphorylates itself and members of the MAPK pathway. Signalling through this kinase leads to cell differentiation and may play a role in the development of proprioceptive neurons that sense body position. Mutations in NTRK3 have been associated with medulloblastomas, secretory breast carcinomas and other cancers. Several transcript variants encoding different isoforms have been found for NTRK3 (provided by RefSeq, Jul 2011). 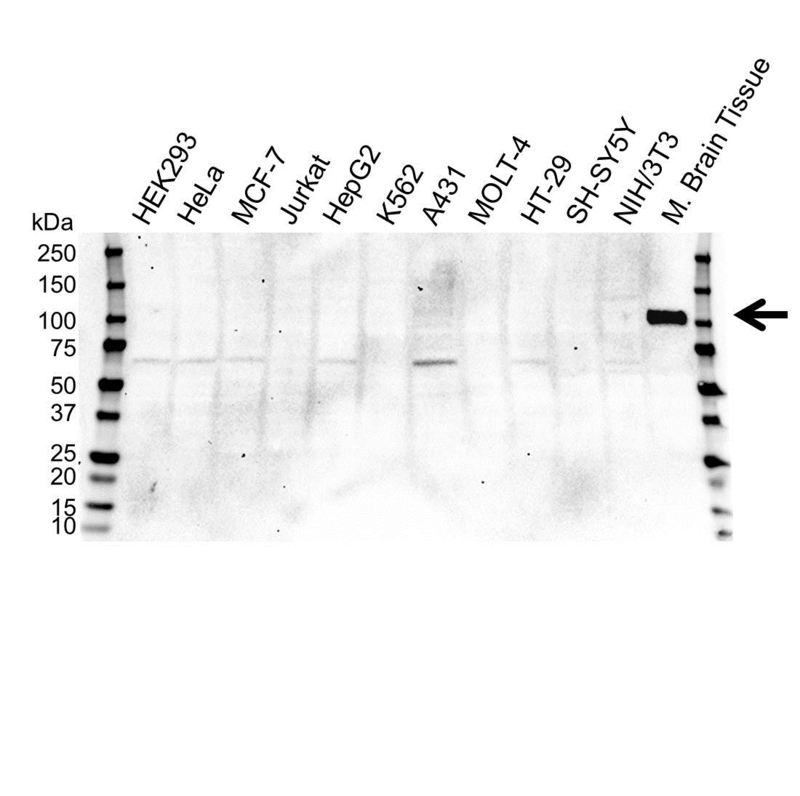 Mouse anti Human NTRK3 antibody detects a band of 100 kDa. The antibody has been extensively validated for western blotting using whole cell lysates. Anti NTRK3 detects a band of approximately 100 kDa in Mouse brain cell lysates.